Airtel 4G Loot Offer: Today we are sharing another Airtel free 4g data offer by giving a miss call. 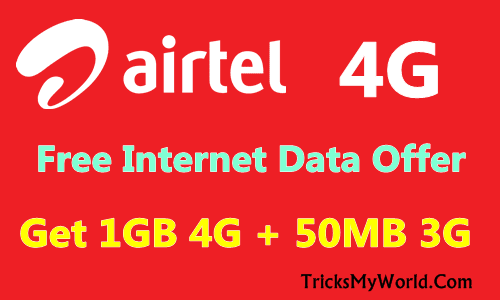 Now Airtel is offering free 1GB 4G + 50MB 3G data by just dialing 52122 from your Airtel 4G sim. The offer valid for 28 days. This Airtel 4g loot offer is working almost all states in India. This offer is working confirmed in Andhra Pradesh, Delhi, Haryana, Karnataka, Kerala, Maharashtra, Tamil Nadu , West Bengal and so on. The credited free 1GB 4G data must use only on Airtel 4G or LTE network mode and the 50MB 3G data you can use on both 3G and 2G network. So if you are Airtel user then you must try this Airtel free 1GB 4G data offer. So Dial 52122 & get 1GB Airtel 4G free internet data for 28 days validity. 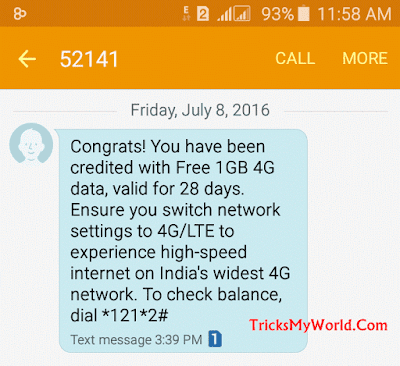 We already posted Airtel 1.2GB Free Data Trick and Get 1GB Free Data for 4G Upgrade. Just dial 52122 from your Airtel 4G sim. Done. Enjoy Airtel 4G Free Internet on your mobile. Must use 1GB 4G data on LTE or 4G Network mode only else mobile balance deduct. The 50MB 3G data you can use on both 3G & 2G mode. I hope you got the Airtel free 1GB 4G data offer. If you have any doubt or problem then simply comment below, I will help you. Keep visit TricksMyWorld.Com for more useful tricks like this. Please share this tricks to your friends on Facebook, Twitter, Google+ etc.